With the weather getting warmer and warmer I get the urge to participate in one of my favorite activities of my youth: outdoor basketball. Some of my fondest memories in hoops have come in church parking lots, elementary school playgrounds and the driveways of friends’ houses. I consider the outdoor game to be one of the foundations of my toughness and grit as a player. I can remember how sore I was and how I wished I had made a better footwear choice. I was playing in a pair of low top Nike Air Total Package and while this shoe was one of my favorites ever to hoop in, they were beaters at that point and not the proper shoe for the constant pounding and grinding that goes with an all day affair in a parking lot. So when I rediscovered Nike’s Outdoor Tech products, I was excited to see what they had to offer. Each year Nike makes a couple of shoes for this little-used division – one shoe is a variation of the previously reviewed Zoom Crusader, which we have seen on the feet of several young up and comers in the NBA like Paul George and James Harden. The other is a new model that pays tribute to another young up and comer: Kyrie Irving and his alter ego Uncle Drew’s catchphrase “I Get Buckets.” Though its shares similarities from other designs of the day – namely the Hyperfuse 2014 – this shoes is very unique and has elements that make it one of the best outdoor shoes I’ve played in. But what about on the hardwood? Well that’s where it gets tricky. It is well documented that I prefer to go a half-size to a full size down in my performance shoes so that I get a snug, glove-like fit. Since size 12.5 seems to be one he rarest size in human existence, size 12 is the way I usually go. The upper of the I Get Buckets is made of some of the thickest Fuse material that I have ever encountered. Though it is a stiff material, I was pleasantly surprised with the flexibility because of how the upper is constructed with many ventilation slits near the eyelets. This serves a dual purpose as both ventilation on hot summer days and to help with flexibility. Under this thick layer Fuse is a thin layer of mesh that is build upon a neoprene bootie. The makes for a very snug (in hindsight I could have gone with a 13 and been OK) and sock like fit without lacing them very tight – something that you look for in any performance shoe and in a shoe made for the rigors of the outdoor game. The plush interior makes for a very conformable fit, but the downside of this shoe comes when you get on the hardwood. 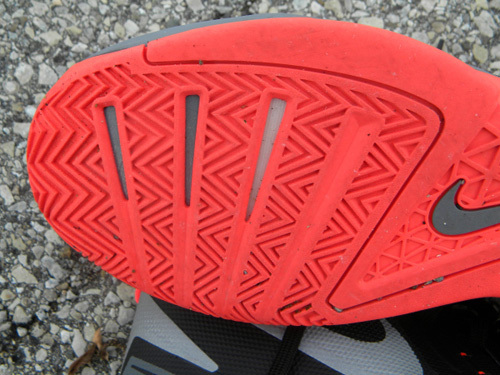 Due to the thickness of the material in the upper you feel most if not all the flex points when you take a step. It’s uncomfortable and strangely enough wasn’t as much of a problem outside on the concrete. 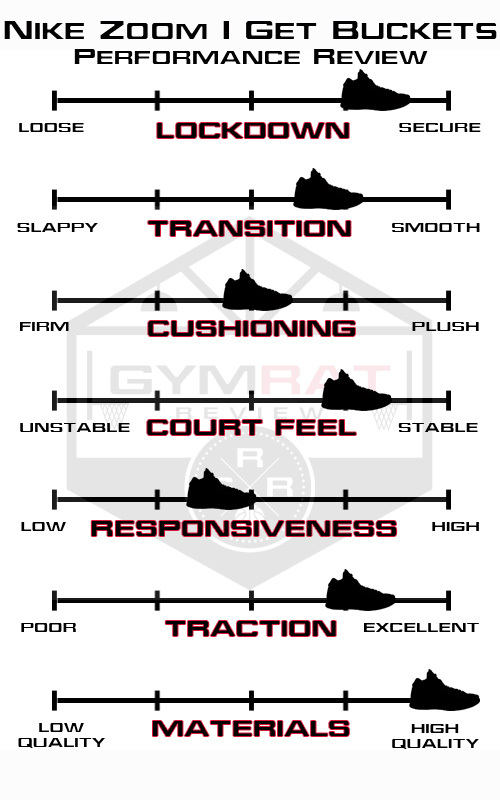 To be completely honest, smoothness in the transition is not a strength of the shoe . The silhouette has decent looking shape, seems to be conducive to a good transition and doesn’t feel necessarily square or clunky. The biggest problem is in the structure – and I’ve seen it in a lot of Nike’s latest models – and the absence of any type of midfoot plate. Maybe its just my personal preference, but I wish this shoe had a plate in the midsole. You can do a plate or chassis wrong like the KD V Elite, but it can also really aid support and transition if used correctly. This shoe and shoes like the Zoom Crusader that I reviewed have softer midsoles and hard outsoles, making the shoe flexible but also a little bit of a mixed bag. While this flexibility is good, sometimes you get too much range of motion or you need something more firm underfoot. A sturdy upper with an overly flexible sole can make for a clunky feel. So while though the transition is adequate, I feel that an upgrade of a midfoot plate would be optimal. It would not only give the shoe a better structure but would also enhance stability. Now this is where it gets funky. It is well documented that we here at TGRR love Zoom cushioning. Though we subscribe to this system and its benefits, not all Zoom bags are created equal. If you remember my review of the Hyperquickness, I described how the softness of the midsole made the cushioning somewhat ineffective. The Zoom bag needs to hit your foot at the right point of the footstrike, and that’s a problem in the I Get Buckets too. Another aspect that seems to hurt this cushioning system is the size of the units themselves. 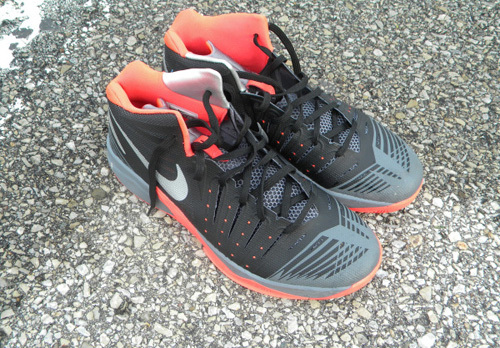 The I Get Buckets is equipped with a forefoot Zoom unit and Phylon midsole. The fact that the Zoom bag is a small met bag under the ball of the foot, combined with the softness of the midsole, almost renders the Zoom cushioning useless. You don’t feel the responsiveness and springiness that you are used to. The HyperRev proved you can have a soft, flexible midsole with Zoom embedded but you better have a full-length bag like it did. 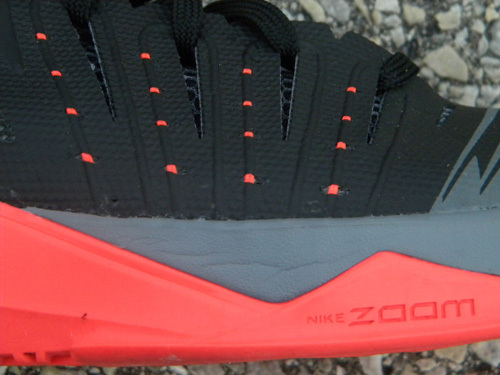 An example of Zoom cushioning done correctly, in my opinion, would be in the Jordan Brand performance line – most notably the XX8, M10 and (one of my new favorites) the Super.Fly II. Not only are the Zoom bags massive in terms of volume but the way they they are installed in a Flight Plate-loaded design makes for peak performance. The plate helps your foot hit the bag properly, and that bag itself is extremely responsive. Obviously, these types of advancements can’t be seen in a shoe with the price point of $115 but at least a bigger Zoom bag would have been better for outdoor use if cushioning was a primary focus. 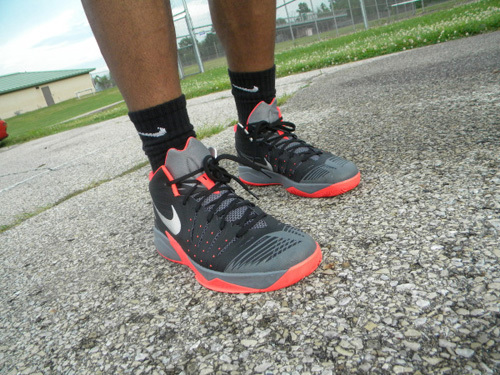 In terms of balance and court feel on the hardwood this shoe gets a decent score. Never did I feel like I was unstable or that I couldn’t get my feet under me in order to shoot or move my feet to get in a defensive position. I felt comfortable landing for rebounds, etc. 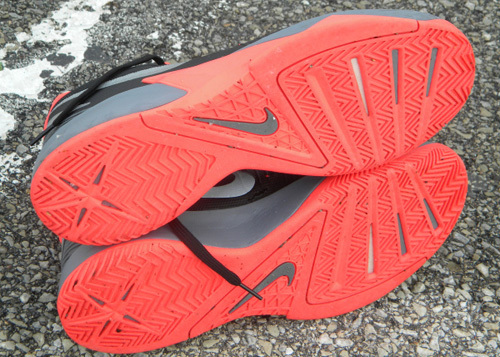 This shoe does run a bit narrow, so that is something to keep in mind if you have wider feet. I am happy to report that this shoe features herringbone traction. While herringbone can wear a bit faster than some if made with soft rubber, I feel that its the best overall pattern based on my personal balling experience. The outsole in this case is a HAGR (High Abraision Green Rubber) compound, designed for heavy outdoor use so that stops it from wearing too quickly. We have seen exaggerations of herringbone in iconic outdoor silhouettes as the Reebok Blacktop and, my personal favorite, the Nike Air Raid. It works for those, and it works for this model. As I have alluded to in previous sections of this post, the shoe is built with thick Hyperfuse, a layer of breathable sandwich mesh and a partial inner bootie. The toe and heel areas are also reinforced. While this seems like a bit of overkill for an ordinary court shoe, these features excel if the is shoe is used outdoors. Outdoors, these materials work hand in hand to protect your foot from the constant pounding and twisting and turning that playing outdoors entails. This shoe is built like a tank, and I can feel that this shoe – at least in the upper – is going to last me a while. In closing, if you are looking for great shoe for outdoor ball in the summer months, this is the one. 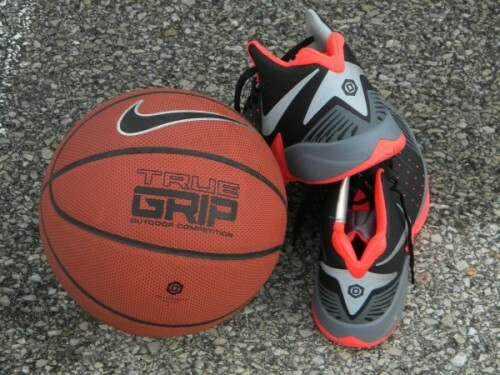 Though it has its shortcomings as a high-performance shoe on the hardwood, in its natural element on the blacktop you will get the most use and the best performance from this model. Make sure you comment if you’ve hooped in the Get Buckets – we love to hear your feedback and talk shoes. Good review. I’ve been looking for an outdoor shoe but the information out there on them is scarce. 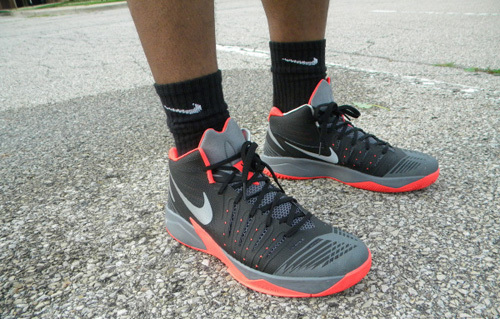 The only ones I know of are the Crusader, the Venomenom, possibly the Hyperfuse and now these. So many shoes are made with soft rubber now that I feel like you have to be informed if you want something that will last a while. I think these probably jump to the top of my list for an outdoor shoe because of the cut and durability. I still want to do some more research before I decide though. Would appreciate it if you could suggest some other outdoor shoes for me to look into. Thanks and keep up the good work. Who wear this shoes in NBA? Just got these earlier this week and played in them today. Coming from a pair of Air Max 180 BB, these were alot lighter and much more breathable. Cushioning was eh, even with the thicker and padded insoles from the 180s. Maybe I need a few more games in them. Fit is definitely great. Feet are very secured with no movement inside the shoe. Traction was actually TOO good. Playing D with a brand new pair was almost like playing with spikes on. Overall, I was satisfied. I just wish the inner bootie of the shoe came back a little further. Which would last longer overall, these or lebron xi? These are specifically built for outdoor play, with a more durable HAGR outsole; the XI is a pretty thin outsole and not designed for hard outdoor wear. You never know until you play in em, but the Get Buckets should be much more heavy duty. how this shoes look and feel today ?